2 Tips for planning a successful event. 1. Your event should serve a purpose. If your event’s sole purpose is just to have an event… you’re only creating more work for yourself. Your time is valuable and should be focused on things that will help grow your business or organization. 2. You will need to be able to gauge if the event was successful. Once the event is over, you will need to calculate if it was a success. To do this you will need to set goals for yourself and keep records of how it goes. You then need to ask yourself: How many people do I want to show up/how many people actually showed up? How much money do I want to profit? Was the overall purpose of the event fulfilled? You should also ASK your participants how they felt the event went. Profit means nothing if the majority of your participants left unhappy. Posted on January 27, 2015 March 27, 2015 Categories eventsTags business tips, event planning, reminderLeave a comment on 2 Tips for planning a successful event. Why do we have websites? Websites are tools that businesses use to make more money. When utilized correctly, they have the ability to inform, promote, educate, and entertain. Here are 25 ways that you can make your website work for your business. HOMEPAGE SIMPLICITY- Now more than ever, your homepage must be enticing. What would a user see in 10 seconds on your homepage? Can the customer find what they wanted to click on, do they become frustrated and leave? Solution to an overcrowded website would be to make “tickets” or large tabs at the top to decrease congestion and increase ease of use. Allow your customers to upload their photos to your website. On social media, use the Upload Photos/Video function to publish photo files directly into your post instead of posting a link that shows a thumbnail. This will encourage them to stay on your site longer. Make sure you have a link on your website directly to your Twitter or Facebook so they can follow you instantaneously. Facebook has added organic reach so you can look into where your posts are actually going. It is now possible to include a photo on a Facebook post. EVERY social platform reports higher publishing rate and interaction when a photo is included. Twitter reports that using tweets creates twice the interaction that a normal website would. Facebook posts get 37% more interaction. Facebook allows users to organically posts more items with photos. If you do not link your photo in the post, Facebook will allow the user to expand your photo, which causes the photo fill the entire width of the page. It is possible to include video on your website, email and social media. You can link to YouTube or embed the video right on your website. Consider This: 100 MILLION videos are watched every week on YouTube. 12x MORE Videos are shared than links/text posts. To get more views on your website or social media, create a video of the most interesting part of an event and post it on each site. People enjoy “Behind the Scenes” scenarios. It is important to remember that there is a Facebook algorithm – I x P x C x T x R, to create a successful post. That translates to Interest x Post x creator x type x recenay. If you need help editing or improving your photos, you can use canva.com. This is an online photo editing tool that allows the user to add text to photos, enhance photos, and create Facebook cover photos. The best thing about canva.com is that this site is FREE to use! Facebook has a tool that allows you to find out what types of people and businesses have liked your page. For example, go to the Mecosta County Area Chamber of Commerce Facebook page. Once there you will find a tab that says “More” with a small dropdown arrow. Click on the tab that says “Likes” and you can see all of the statistics for the page. Say “Shhh!” Make things seem secretive and people will be more interested. Say “This just in” make them seem like they are the first to know. An excellent way to do this is to ask your vendors to participate in a “2 for 1” deal or other discount. Post it to your website, social media, email and/or text it. Another way is to create a promotion, “The next 10 people can get…” etc. This will increase traffic on your site. Don’t forget to remember to include a photo if you’re sharing on social media! If your event is notorious for bad parking and traffic, promote your text list as a possible solution and parking update mechanism. It is easy to send out a mass text message as the traffic situation changes. You can put a volunteer in charge of the text alerts. It might be prudent to include a “Don’t Text & Drive!” every so often for your civic duty. According to Venture Beat, 98% of people open text messages compared to the 22% that open emails. You can use Facebook to create an interactive contest to increase both the amount of time people spend on your page and the amount of people that visit your page. It is possible to utilize Likes and Comments as voting mechanisms. You still can’t make people tag themselves or share the post as part of a contest. Like everything else, social media does not exist in a vacuum. 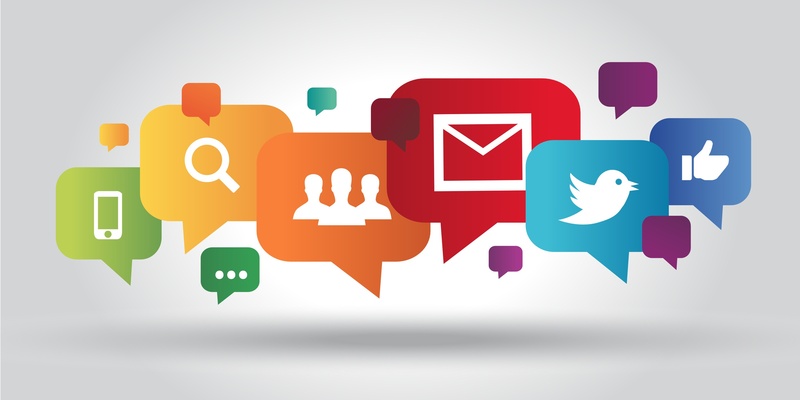 One way to stay relevant to your customers is to post what people are talking about already. This allows your business to become a resource for things going on in the community. This site is a way for users to share experiances through a series of photos. Instagram is organized by HASHTAGS. The trend is moving towards the younger generation. IFTTT stands for: IF THIS THEN THAT. Basically, you create “recipes” to make something automatically happen within your social media. The concept is that if you post something to Instagram, the app will automatically post it on Facebook, Twitter and Google+. IFTTT can be found in your App store or on http://www.ifttt.com. There has been a decline in “organic reach” for Facebook posts from >20% to <3%. It is time to re-evaluate your Facebook investment. There are three new possible strategies for businesses regarding Facebook. Engage your fans elsewhere. There are many different social media sites that can be utilized. Pay up. You can pay to have your business featured on people’s newsfeeds. There are a few groups that you can directly target with Ads. It is important that you promote your sponsors online. One way is to interact with sponsors – especially big ones – on social media. You can post their deals or promotions. This will cause them to retweet and favorite you. EVERYBODY WINS. One way to increase your Twitter followers is to set up a live Twitter feed on some side screens at your event. Guests can tweet at you with #YourEventName. Their tweets show up on the big screen, allowing the guests to feel part of the event. Everyone loves a random holiday. Look them up in advance, and post about them. You can even schedule it in advance through Facebook! A schedule of holidays can be found at bizzaarholidays.com. You can now view analytics from your twitter account! They can be found at http://analytics.twitter.com/. It is important to note that you may have to enter payment information, but you don’t have to pay to access your analytics. You can attach rich photos videos and media experience to tweets in order to drive traffic to your website. By adding HTML to your website, when a visitor tweets from that page, photos, videos, app instructions, are linked to that post automatically on that user’s account. You can also work to incorporate Pinterest to your businesses social media profile. By adding boards about things to do in your city, links to your vendors pages, places to stay, craft projects, and ‘how to’ cooking boards. You can create an email “club”. Everybody loves to be a part of a club. Make your email list or text list a “club” sign up or encourage people to pay to join with perks. This works for both kids and adults. 9 of 10 smartphone shoppers have used their devices to buy products while at a brick-and-mortar store. 50% smartphone users say, that if a retailer’s technology isn’t easy to use the first time, they will stop using it. One option to capitalize on the increased use of smartphone technology is to create an app for your business. If you can’t afford an app, then you’re your website look like one. The internet is a fast moving entity and people are quick to forget. A story that is in the news today is tomorrow’s history. It is important to ALWAYS RESPOND to comments, even the negative ones. The worst thing you can do is not be a part of the conversation. Responding to positive comments can increase positive feelings towards your business. For more FREE ONLINE MARKETING TIPS please visit: Facebook: Saffire Events, Twitter: @SaffireEvents, Instagram: saffireevents, Pinterest: saffireevents, YouTube: saffirestudio, iTunes: The Amplifier Event Marketing Podcast – The Best 25 Ideas for Online Marketing.